With an assortment of photographs, essays and quotes this book gives faces and voices to some of the millions of Americans who work at, run and utilize our libraries. The book features public, private, academic and every other kind of library one can imagine. 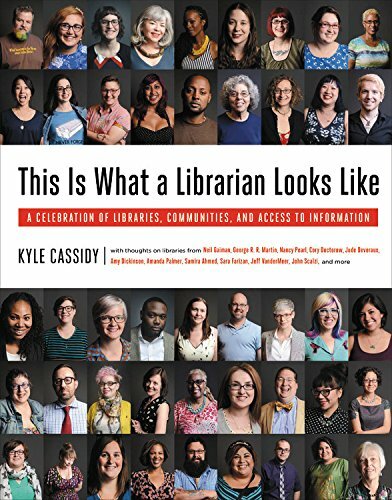 The concept of the book occurred to author Kyle Cassidy after he worked on a story about librarians for Slate Magazine in 2014. He became fascinated by the range of personalities, talents and passions of the people who spend their lives providing information and service to their communities. Cassidy catches a humor and humanity to the subjects that he photographs. Each photo is also accompanied with a brief quote from the subject, or a description of what they do, and where they work. What really makes the book special is the assortment of stories and articles from some of the most famous writers, journalists, and commentators working today. Authors include: Neil Gaiman, George R.R. Martin, Nancy Pearl, Cory Doctorow, Paula Poundstone, Amanda Palmer, Peter Sagal, Jeff VanderMeer, Sara Farizan and others. More than just a boost to those in the field, this also serves as an interesting sociological look at the diversity and drive of the people who choose to dedicate their lives to the collection, protection and dissemination of information. Previous Where can you find “Twin Peaks” Merch?